The difficulty with capturing modern, but also more recent art movements in Central Europe, including Slovakia, is related to the lack of existence of a uniform professional procedure for defining the contexts of the local artistic scenes in relation to major Western-European and later Euro-American art movements. As a result, these artistic scenes, except a few concrete exceptions (such as Czech Cubist Architecture) seem to be a rather local reflection of major global trends with typical time delay in adoption of the latest expressive and conceptual processes. 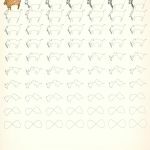 In general, the most valuable are considered to be combinations and mixtures of different techniques, which within the individual art styles function as quasi-marginal reflections. They refer to possible interpretations of individual artist positions in different social, ideological, thematic and visual contexts. When grasped in this way, many of the art works often acquire different meanings from those initially declared in their art manifestos, however their historical value is often times valuable in much the same way as that of their models from the ‘great’ art history. The historic turning point of 1918, the end of World War I and establishment of Czechoslovakia is the most important political milestone in the Slovak history. Despite the fact that from an artistic point of view it was not a turning point to such extent that it could be used to define and delimit the emergence of modernist traditions (this had occurred earlier in a diffuse way), it is still possible, in connection with the gradual emergence of institutions and the free media, to perceive this milestone as a temporal dividing line between what had until then been called ‘art in the territory of Slovakia’ and the modern concept of ‘Slovak art’. Several factors influenced the course of Slovak painting and art development at the beginning of the 20th century. Slovak territory lay at the northern border of the Austria-Hungarian Monarchy without its own autonomy. It was a nation which had not preserved or established larger natural urban centres with characteristic educational attributes – universities, academies, specialised museums built on scientific research and subsequent systematic collections, places for the dissemination of culture, newspapers, specialised journals and so on – which together would meet the requirements for the fulfilment of the national awakening process begun in the 19th century. From the artistic point of view, in which addressing national issues was not always a top priority, we can therefore speak of an inclination towards various artistic centres, namely towards Vienna, Budapest, Munich and later Prague (Paris was mediated only through the art works of some lone artists). This allows us to characterise our region as an intersection or periphery of several centres (in opposition to possible parochialism when related to one centre only). This fact co-determined a fairly wide plurality of art works, amongst which painting, despite a certain temporal lagging behind when compared to the current trend of Modernism and the Avant Garde in Paris, certainly appeared to be the most progressive. In short, it can be pointed out that regardless of where the artists painting in Slovakia gained their educational background, after returning home they would focus their work (except the possibilities offered by psychologism in portraiture) more on seeking local rather than personal characteristics, more on the visual mediation of what could immediately be seen and generally defined rather than personal philosophy or courageous radicalism (which gave rise to the great personalities of the world Modernism and Avant Garde art movements). The first basic formal source of interwar art (1918-1938) was the final stage of Impressionism during the first decades of the 20th century, commonly characterised as Central European Luminism imbued with the impact of Symbolism. Already through this short characterisation it can be sensed that it was not the formal analysis of painting structure by the means of colour that was exclusively important for the artists, but the use of painting that transcends it, to mediate the widest range of symbolic themes including meditative, moody or social ones, all romanticising the meaning of the work of art. Therefore today’s perception of the work of Ladislav Mednyánszky and Dominik Skutecký, who may be regarded as the most representative within the given domain, will not be accurate if we observed their work strictly through the criteria of Impressionistic painting, which is more purely represented, for instance, by the work of Maximilán Schurmann who, albeit after a considerable delay, came closest in his art to the French Impressionistic school. However, this light-focused type of art did not take root in Slovakia on a mass scale, in contrast to the popular nationally-orientated art characterised by elements of folklore which were formally closer to the Slovak environment. The second significant art movement of the interwar period was characterised to a far greater extent by the symbolic aspect of the art work, and was represented by a larger number of artists influenced by the Hungarian Art Nouveau and working mainly out of centres in southern Slovakia (Bratislava, Komárno, Rožňava), who later became the focus for manifestations of inter-war modernism. However it was Košice in particular which stood out during this period, since it was here that these expressive artistic tendencies reached their peak in the so-called Košice Modernism, which absorbed much wider stimuli not only from abroad, but also from the existing tradition of its own artistic circle. Košice Modernism was particularly associated with the work of Konštantín Kövári-Kacsmarík and Eugen Krón. Under the authority of Dr Jozef Polák, Director of the East Slovakia Museum, Krón had opened a private art school and through this had significantly influenced the development of the next generation of artists. 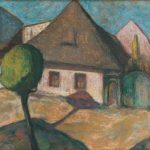 Subsequently, more mature lone artists gathered in Košice, their art works reaching a peak just a little more than a decade after the establishment of Czechoslovakia. The most significant representative of the interwar period is Anton Jaszusch, whose short period of orphic variation of expressive painting (1922-1924), with its typically post-war theme of tragicality and fatalism through which he seemed to paraphrase the stylistic expression of Futurism, has no parallel in Slovak fine arts. It was the greatest attack on Modernism, and for this reason perhaps it did not meet with an adequate response (siimilarly a mere 10 years later the more consistent Modernist manifestations of Fulla and Galanda were left without appropriate response). The work of Jaszusch represented first contact with a more radical abstraction in Slovak painting, and although the artist did not fully free himself from symbolic reference to figure, the tendency towards abstraction cannot be questioned in his case. Among the symbolist painters a narrower group excelled using expressive artistic language to mediate socially-focused works of art. Imrich Weiner-Kráľ, with his grounding in a Nouveau Art-type of artistic expression painted surrealistic art works with strong social features thematically correlating with nationally-oriented modernism, the character of which he adumbrated to a certain extent. 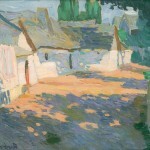 Of particular note was Edmund Gwerk, who transformed his original Arts Nouveau grounding into the expressive landscape painting, and on Zoltán Palugyai, who remained loyal to the Arts Nouveau grounding to the greatest extent and, in his soft pastel paintings, embodied the lyrical nature of the country. 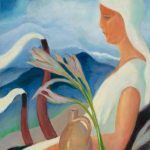 The most striking art movement, on which the basis of Slovak Modernism has long been defined, is romantically-perceived painting, which can be comprehensively called the ‘Slovak myth’. The painters concerned similarly followed various style groundings and influences, however in contrast to previous art movements the major role was not played by dominant Art Nouveau enriched with expressionist or impressionist tendencies. On the contrary, what can be noticed is the influence of various forms of European Modernism and the penetration of Cubism, Constructivism and Neoclassicism, particularly the art works of Pablo Picasso and other painters. 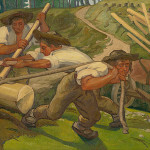 Although Art Nouveau influences can still be found in the works of Martin Benka in which he enthusiastically depicts the ordinary Slovak people at work, the character of his work has influenced many artists and still raises fundamental questions about the nature, meaning and focus of ‘national’ phenomena in painting. In opposition to the heroic and historic concepts of Benka stand mainly the art works of Mikuláš Alexander Bazovský and Janko Alexy, who can be regarded as more sober-minded in relation to national themes. Although they were using similar themes as Benka – rural symbols, figures of villagers and so on, their treatment of the theme was more essential and archetypal, tinged with an effort not to perceive the Slovak nation as an idealised a priori heroic ethnic group. The bi-polarity of the national model in painting was a very important ‘critical’ constant – in many ways it predetermined a sharp encounter of contrasts in the future, where ideological and (in the eyes of its exponents) related style and formal assumptions often stood against each other (for instance in the 1960s). Furthermore, the two central personalities of Slovak modern painting – Ľudovít Fulla and Mikuláš Galanda – who used the European Modernist mode of expression, especially of Picasso Cubism, partially intervened in this structure. 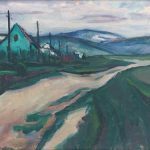 In the early 1930s they shifted the centre of the national aspect of Slovak painting from thematically-restricted, more or less illustrative rural romanticism towards a separate value and typical delimitation of modern painting. Through the published Private Letters of Fulla and Galanda (manifesto of modern Slovak painting) they raised basic questions about the other than depictive function of painting and about its value. The inter-war period was also linked to the early art work of Koloman Sokol and of lone painter Július Jakoby, along with numerous other artists, whom some theorists collectively refer as ‘Generation 1909’. Their art-work transcended into the following decades and brought many differentiations – such as urban motifs with a flavour of hedonism or stricter social motifs. 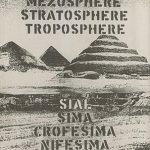 Sokol later founded a Graphic Art study programme at a university in Mexico. Ester Šimerová-Martinčeková completed her artistic education on the borderline of Cubism and Constructivism in Paris (under Alexandra A Exterová). Other artists (Ján Želibský, Ján Mudroch, ‘Daumierian‘ Cyprián Majerník, Ladislav Guderna and many others) represented a visual variant of the heavily supra-realistic tradition in literature, especially in poetry. The period that heralded the beginning and duration of the World War II left its mark on Existentialist themes (for instance Majerník’s Don Quixote scenes), with supra-realistic efforts adopting some apocalyptical intentions, a tendency which to some extent persisted until the post war period (for example, in the expressive painting of Vincent Hložník with the peak of his work at around 1948). The most orthodox period of socialist realism, which had virtually no support in the Slovak tradition, occurred from 1948-1956-7. 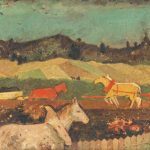 Many talented artists (Mária Medvecká, Ladislav Čemický and others) yielded to the ideology that resulted from the genre painting of the 19th century, with firmly determined themes of heroism and the unlimited optimism of an ordinary working man. 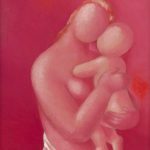 However, on the other hand quite a few interesting art works were created that are yet to be given an adequate recognition (for instance the art works of Bedrich Hoffstädter from the early 1950s or Ladislav Guderna). The common aim of many painters was an endeavour to find a compromise between what was formally required and what was their own creative opinion, which resulted in many remarkable variants of early modern traditions (for instance the early impressionist paintings by Milan Dobeš), some of which are original pieces of criticism of the prevailing doctrines. In an especially productive way this period was endured by lone artists such as Šimerová-Martinčeková or Jakoby (his lyric-expressive style was right at that time enriched with a dimension of criticism and grotesqueness, with the help of which he continued developing his distinctive painting style until his death) or Ernest Zmeták. Paradoxically it was thanks to the 1950s that the new independent gallery institutions were established (such as the Slovak National Gallery (SNG), Bratislava and others) which, through building their systematic collections, participated in the assertion of the current art work variations ranging from those orientated ideologically to the freer Neo-Avant Garde ones of the 1960s. Due to the fact that a totalitarian regime allowed personalities such as Ľudovít Fulla and others to teach at the newly-established Academy of Fine Arts and Design (VŠVU) in Bratislava, the beginning, and with regard to the university, the first generation of artists, had an adequate educational grounding in European modernism and the Avant Garde. This was markedly visible in respect of the first graduates in around the year 1956 (simultaneously with the general political thaw related to the open criticism of Stalinism) as a kind of farewell to academic Socialist Realism and turning towards earlier models, among others also those which had not yet been dealt with in Slovak art. This trend was characteristic of the youngest generation of artists, the most noticeable representatives of which founded the Mikuláš Galanda Group (including painters Milan Laluha, Milan Pašteka, Andrej Barčík, Vladimir Kompánek and others), who displayed their art works at (often forbidden) exhibitions in the Cyprián Majerník Gallery, Bratislava founded by Ernest Spitz. They were turning towards Modernism and Avant Garde traditions, absorbing arts that had a tendency towards abstraction of various genres and seeking to apply this art into the themes typical for their home environment through which their art work became a typical successor of the pre-war art work of Fulla and Galanda. In a sense this was the final reflection on national phenomena in arts, its archetypal features and qualities. 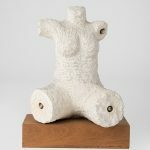 During the period 1960-1966, their artistic counterweight became Bratislava’s Confrontations circle, based on the tradition of non-figurative art, which in its pure form now appeared in Slovakia for the first time. The dominant tendency was Art Informel, influenced from a certain standpoint by an import from the Czech Republic, where it was based on a strong tradition of Surrealist art-work. Among purely fine arts representatives of Art Informel, the most significant was Marián Čunderlík, whose picture cycle Zrkadlá (‘Mirrors’) most embodied the existentialist basis of Art Informel. Rudolf Fila represented a type of lyrical-abstract painting, in which already in the early 1960s he foreshadowed a phenomenon called ‘citation’, which later formed the centre of all his art-work. Miloš Urbásek and Eduard Ovčáček combined Art Informel features with the letter signs of Letterism. Transformation from painting towards the object was a contribution of Joseph Jankovič (separately he also contributed within the context of ‘New Figuration’), Mira Haberernová-Trančíková and Stanislav Filko, whose greatest contribution was interlinking surrealistic principles with then pop-art features in his 30 Oltáre (‘Altars’) from around 1964. Purely abstract art works of most of these artists were soon infiltrated with various objects which resulted in the emergence of ‘assemblages’, characterised by combining various, often conflicting philosophical principles (which, as has been pointed out several times before, is a typical feature of Slovak Modernism). The certain Eclecticism that lasted until the mid 1960s can be perceived as both a first way of announcing the end of Modernism in Slovakia and as a harbinger of a paradigm change in the original art forms – painting ceased to be a mere hermetic image and throughout the following decades its purpose was caught within the new and broader contexts of especially conceptual and action Art, which essentially changed its artistic function and nature – the art styles that occured in parallel were more pluralistic in approaching one another. The period around 1965 was a major turning point – the more open political climate allowed artists to travel, reviews brought from abroad and also domestic ones focusing on current world art topics without ideological constraints appeared in the specialised journals, and discussion and open controversy emerged. In general this period is perceived as the penetration of the Neo-Avant Garde, through which the Slovak art scene, was able to participate actively in the most recent world art trends. 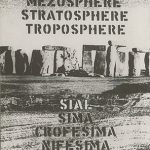 Many art styles (albeit with the prefix neo-) appeared in Slovakia for the fist time and their promoters were once more the youngest artists from the afore-mentioned circle of graduates from the University and ateliers of professors such as Mudroch, Peter Matejka, Želibský and others. Painting became a medium referring also to other aspects than those that had been common up to that time, and although the standard hanging panting did not disappear entirely from Slovak art, its development was from that point forward determined more by transition towards other, rather than solely painting, techniques. 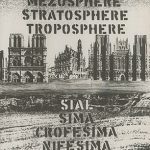 The strong and extremely refined trend of Neo-Constructivism was represented especially by Milan Dobeš (from 1964), Alojz Klimo, Tamara Klimová, Eduard Antal, Anastázia Miertušová and others. Conceptual art concentrated particularly on drawing, however it is worth mentioning the paintings of body artist Peter Bartoš who, despite his efforts (he gave away all the art works from his painting studio in 1965) never freed himself from a classical educational grounding in painting. Equally interesting, painting with a large dose of pop-art irony was at this time created by Július Koller and within the visual poetry also by Vladimír Popovič; secondarily it was not avoided by Alex Mlynárčik either; for Stano Filko painting soon became a medium of his large neo-expressive works of art; similarly also for Juraj Bartusz as a representative of Action and Gesture painting, whereas the latter painters were the main representatives of a particularly significant Conceptual art movement in Slovakia. Besides the above-mentioned trends in painting, the second half of the 1960 witnessed the promotion of various forms of Lyrical Abstraction (for instance in connection with poetry), in a sense within the context of the Czech ‘New Sensibility’, whereas on the opposite side was the enrichment of the former branches of Realism with Pop-art and Hyper-Realism associated with the new brushwork technique called the air-brushing. From a technical point of view several authors were affected by Lyrical Abstraction, it was especially visible in the early landscape paintings of Rudolf Sikora, one of the main representatives of the second wave of this concept in Slovakia – the wave that did not reject aesthetic painting as the final visual form. Similarly it could also be perceived in the works of other artists such as Dezider Tóth which prefigured many of the later works of the future generation of painters being formed at the turn of the 1970s and 1980s and known under the collective name A-R (Avance Retard). The latter group developed around Rudolf Fila, who had been extremely active in the 1970s as a teacher at the Secondary School of Industrial Art in Bratislava. His pupils included Daniel Fischer, a representative of Action Painting, Milan Bočkay whose life topic became the phenomenon of illusion, proto-feminism oriented Klára Bočkayová, Marián Meško and other artists devoted to sculpture, object and other media. Realism as such has undergone an interesting evolution in Slovakia. Its visual aspect, ranging from Verism to Modelling, inspired by an enormous number of models of the world of Modernism, became a major mode of expression for a wide range of unreadable artists, who at the expense of artistic frankness benefited personally. Besides them however there were several of those who, via realistic forms of expression, were able to depict a gentle or extremely insistent critical testimony, although due to the acceptability of their expression they were permitted into the official exhibition halls during the ‘Normalisation’ period. This is mostly noticeable in the artworks of Julián Filo and Jozef Srna throughout the whole 1970s and 1980s. An adherent, applying the language of Hyper-Realism to convey certain female emotionality and troublousness, was Veronika Rónaiová, while on the contrary, doubts with a tendency towards nihilism characterised the early art works of video artist Peter Rónai. Filo and Srna were connected via an important factor – they could both perceive tensions in a mundane moment, Filo more in the interpersonal friction, Srna in turn in a seemingly friendly landscape painting (which became critical only because it was portrayed realistically) or in an unusual still-life painting. At the beginning of the 1970s two noteworthy movements expanded. 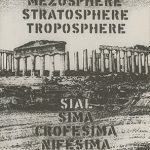 The first was the Club of Concretists (membership by then comprising mainly Geometric abstraction artists) which has continued to operate successfully up to this day with a membership which has grown gradually as new artists have joined (for instance Blažej Baláž and Mária Baláž in the late 1980s). 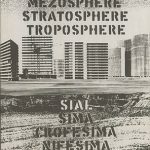 It was revived in the early 1990s against a background of constructive and geometric tendencies with contributions from Adam Szentpétery, Štefan Balázs and others. Several artists who became members of the Surrealistic Group (eg Karol Baron) represented the second movement. There were still several other painters indirectly linked to Surrealism (eg Agneša Sigetová). 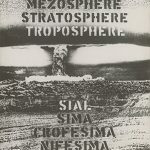 Generally, however, the 1970s was a difficult period of political Normalisation (following the occupation of Czechoslovakia in 1968), which manifested itself in the exclusion of artists who had until then been compulsory association members of the Slovak Fine Art Association, the only ‘entry ticket’ which allowed artists to participate regularly in official exhibitions. The consequence of this was some kind of retreat into the inner self, a focus towards science, nature or traditional values. 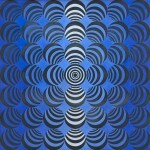 It was most strikingly manifested in some distinct lone artists – Pašteka created his best art works within the ‘new figuration’, Urbásek moved from the geometric analytic fragmentation towards lyrical expression in painting, Jankovič was the first one to experiment with shapes generated by computer (later in 1990s great success was achieved in the field by Vladimír Havrilla and his virtual studio), and Sikora with his scientific focus foreshadowed the ecological tendencies in art. These and many other artists only rarely participated in official exhibitions. With the political climate finally improving in the mid 1980s, it was the youngest generation of artists, those who are nowadays considered to be the forerunners of Postmodernism (Ivan Csudai, Stanislav Bubán, Daniel Brunovský, Ladislav Teren and others), which benefited most. Through their art work they offered a bizarre variation of expressive painting combining German Neue Wilde and Italian Transavantgarde. Despite the great interest shown and success of this return of expressiveness into the Slovak art environment, for the majority of artists it did not mean a permanent focus, and over time many of them reflected different stimuli, while representing their own distinctive styles (Csudai) rather than the joint styles of particular movements. In painting as in other fields the 1990s were characterised by artists’ efforts to declare certain universal themes (Robert Urbásek, Bohdan Hostiňák) – which may be regarded as a typical manifestation of coming to terms with the cultural traditions of the global Neo-Avant Garde by artists who, following the Revolution of 1989, were encountering many movements for the first time. Painting in this context marked a certain recession and its dominance could be felt once again after 2000, simultaneously with several internal trends – the move towards a pragmatism and figuration, rehabilitation of realism and extreme realistic positions and the ‘ostalgia’ phenomenon (nostalgia for the ‘Ost’ which is German for ‘east’ and refers to the former East Germany). The main representatives were again the youngest generation of painters who spontaneously and without complex resorted to the traditional medium of expression. In general it can be said that the Slovak painting after 1918 formed the main cultural heritage art form. Its history down to the mid 1960s was the history of a dominant two-dimensional art, but thereafter radical changes took place along with a broadening of the former paradigm. Its continuous peaks and falls resulted in attenuation in the 1990s when the painters themselves could not find the right words for continuous defence, paintings were not created by convinced theorists and thus did not manage to win recognition within the new media competition which also incorporated the parameter of time in its mode of expression. From a certain perspective it can be said that Post-modern art theory in Slovakia in the 1990s was ahead of its own artistic practice, and it was painting in particular that was affected and which temporarily appeared to be incapable of further development. It was the loosening of this theoretical dogmatism at the turn of new millennium and the youthful criticism incorporated in the painting itself which challenged the cumbersomeness of painting, giving painting its new popularity and ability to attract today’s extremely visually mature but also art-weary viewer.